EnglishCentral has partnered with Seed Learning, an industry leader in language learning products and services, to develop a new suite of products for the Young Learner (K-12) Market. These courses were developed specifically to cater the needs of those who are just starting to learn the language and include variations in topics such as phonics, reading and comprehension, world history, presentation skills and a lot more. They cover CEFR Levels A1 to B2. Top Kids is a six-level course for young English language learners. This engaging and instructive course incorporates a systematic double-strand approach to introduce vocabulary and grammar within thematic units graded over six levels. The double-strand approach in building vocabulary and grammar skills of learners is key to the course. English language learners need to acquire vocabulary in order to comprehend English and participate in classroom discussions, and as well, it is key to reading comprehension. In addition, grammar is central to the teaching and learning of languages as it is the foundation of a language. 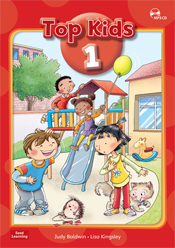 Top Kids prepares young learners to be able to understand and communicate well in English on a variety of subjects. 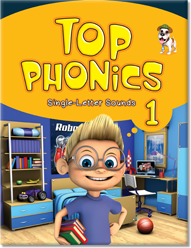 Top Phonics is an easy-to-use five-level phonics series developed for young learners of English. Starting in Top Phonics 1, students will learn to recognize and say the letters of the English alphabet. By the end of Top Phonics 5, students will be able to read and write common English words and phrases. The five levels of Top Phonics provide a guided, step-by-step presentation of single-letter sounds and vowel and consonant combinations. Top Phonics allows learners to develop their English skills in an engaging, systematic, and effective manner. Easy Fun Facts is a three-level series designed for elementary students of English who are being taught comprehension skills in the reading-to-learn stage. Easy Fun Facts exclusively focuses on nonfiction texts to equip students for future study of academic material in English. The series also utilizes a four-strand approach that sets a foundation for students to practice receptive and productive skills alongside focused language study and fluency practice. Fun Facts is a three-level series designed for elementary students of English who are seeking to develop their comprehension skills in the reading-to-learn stage. Fun Facts exclusively focuses on nonfiction texts to prepare students for future study of academic material in English. The series also utilizes a four-strand approach that sets a foundation for students to practice receptive and productive skills alongside focused language study and fluency practice. Easy Fun Reading is a three-level series designed for emergent students of English who are beginning to move from the learning-to-read stage into the reading-to-learn stage. Easy Fun Reading is designed to set a foundation in reading in order to prepare students for future study of academic material in English. The series also utilizes a four-strand approach that provides the framework for students to practice receptive and productive skills alongside focused language study and fluency practice. Fun Reading is a three-level series designed for elementary students of English who are moving from the learning-to-read stage into the reading-to-learn stage. Fun Reading incorporates short and simple fiction and non-fiction texts to support students in developing fundamental readings skills required for future study of academic material in English. Strict vocabulary control of all passages and activities allows students to gradually accumulate new vocabulary while practicing learned items from previous units. For a full view of the Seed Learning Materials, see this catalog.